Happy Friday!! I’m home, happy and rested from my little jaunt to Utah. Moms will understand this: you leave for a few days and miss your kids the whole time and feel guilty for not being with them, and then within 2 minutes of getting home everything is right back to how it was before you left. Like all of it. You been there? But I will say that having had a minute (or two days) to breathe, that I am finally feeling truly in the Christmas spirit. Like I came home and finished decorating and made plans with the kids to see Santa and make gingerbread houses this weekend. Christmas lights are going up this weekend and I finally got a wreath on the door. 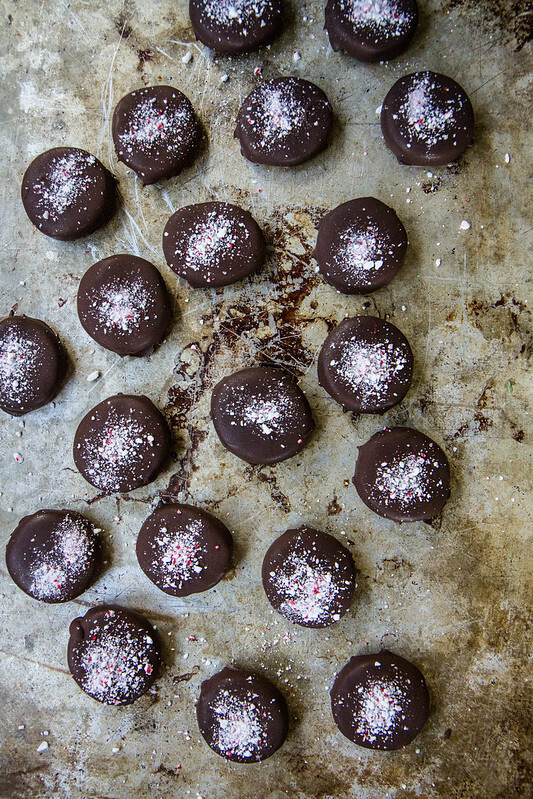 Another perfect addition to the Holiday season are these Vegan Chocolate Peppermint Patties. They are like little bites of heaven. Yorks have long eben a favorite candy of mine and now I can enjoy them again in this gluten free vegan form!! They are sooooo delicious! In the bowl of a standing mixer, combine the coconut oil, corn syrup and the powdered sugar and beat together with a paddle until combined. Add the peppermint extract and the water and beat until soft and fluffy. Place the dough in a disc shape onto a sheet of wax paper. Wrap it and stick in the freezer for 30 minutes. Prepare a sheet pan with a sheet of wax paper. Roll the dough out until it is 1/4 inch thick. Use a 1” round cookie cutter to cut out as many rounds as you can/ You can re-roll out the scraps and cut those too. Place the rounds on the wax paper covered sheet pan. Stick the pan in the freezer for at least an hour. Melt the chocolate chips in pyrex bowl in the microwave until melted and smooth. Place a peppermint disc on the top of a fork. Dip the disc in the melted chocolate until it is completely submerged and then let the extra drip off through the fork tines. Gently set the chocolate mint on cooling rack so that any extra chocolate drips off while they set up. 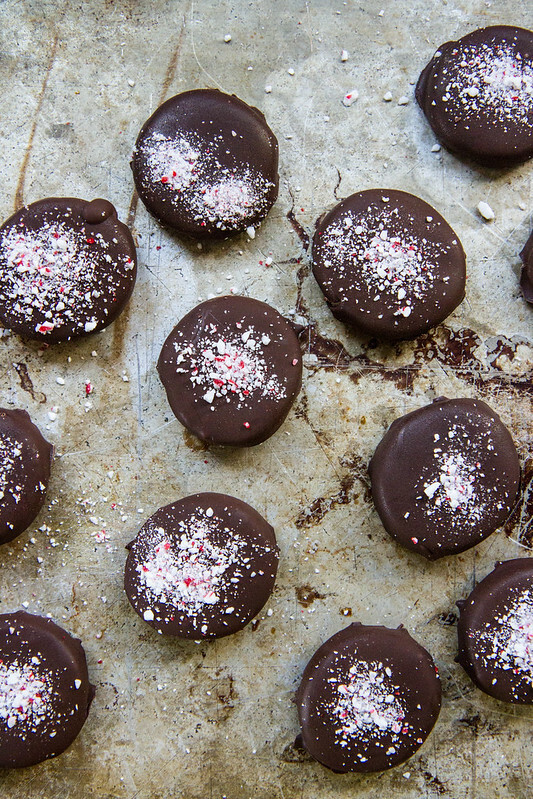 Immediately sprinkle a pinch of the crushed candy cane over the top of the chocolates. Place the rack in the freezer and let the mints re-freeze, about 20 minutes. Pop the mints off of the rack and store them in an airtight container and store it in the freezer until you are ready to serve. These look fantastic, Heather. Glad you are finally getting into the Holiday spirit. I’m still being slow over here. I gotta get some decorations up this weekend! Lois is going to crush these pep patties!! 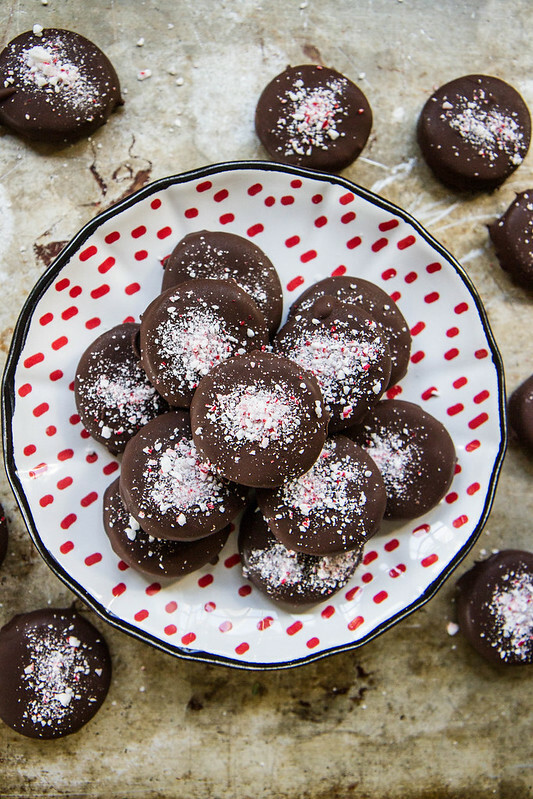 We absolutely LOVE York Peppermint Patties and these look so… good. Who knew I could make them at home. Question: Can I replace corn syrup with another ingredient? So festive! Great holiday treat! LOVE these vegan minty treats!! I have to try this! They look beyond delicious! This sounds wonderful. I’m thinking it would be easier to instead of rolling dough into a disc and chilling to then roll out and cut with a round cutter; roll the dough into a log to chill then just slice into 1/4″ thick slices. It would save a lot of re-rolling and there would be no wasting. This recipe did not turn out for me. I followed it verbatim and the mint never set completely. I had to put it in chocolate molds to salvage it. Next time I would add more powder sugar and not roll out the mint, but rather breeze it in a tube shape and cut it to the right thickness.